TARANIS is a low altitude satellite dedicated to the study of the impulsive transfers of energy between the Earth atmosphere and the space environment occurring above thunderstorms. In Celtic mythology Taranis is the god of thunder. The mission TARANIS (Tool for the Analysis of RAdiation from lightNIng and Sprites) is funded and operated by the French space agency CNES. LPC2E is in charge of the scientific coordination of the project and the technical coordination of the scientific payload. TARANIS is a low altitude satellite project to be launched by 2020 and dedicated to the study of impulsive transfers of energy between the Earth atmosphere and the space environment. Such impulsive transfers, discovered by the observation at ground and on satellite (FORMOSAT-2) of Transient Luminous Events (TLEs) and the detection on satellites (CGRO, RHESSI, FERMI, and AGILE) of Terrestrial Gamma ray Flashes (TGFs), are observed above active thunderstorms and appear to be correlated to lightning activity. Artist’s impression of TARANIS. Credit image CNES. 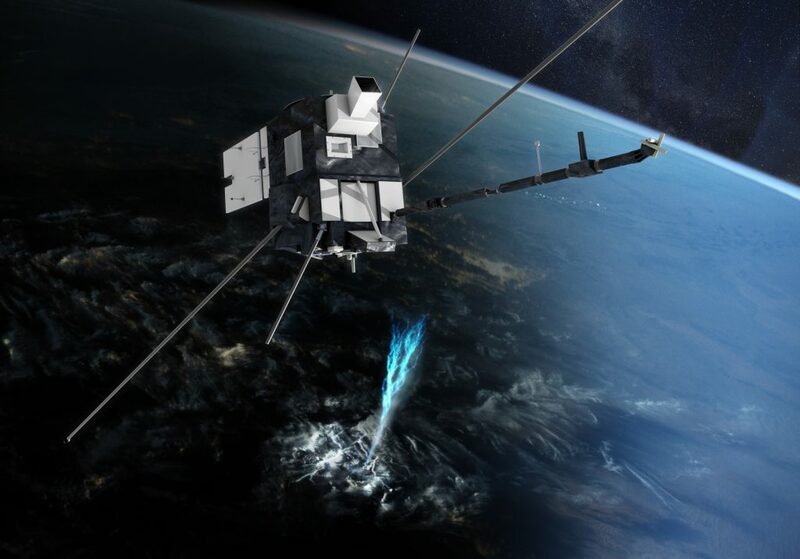 • Onboard wave field measurements in a frequency range running from DC to 30 MHz allowing to record radio signatures of optical and particle transient phenomena and to detect the presence of quasi-electrostatic thundercloud fields. TARANIS belongs to the CNES Myriade satellite family. It is a three axis stabilized satellite. The dimension of the platform is about 1 m3. The total weight is around 180 kg, including about 36 kg for the scientific payload. 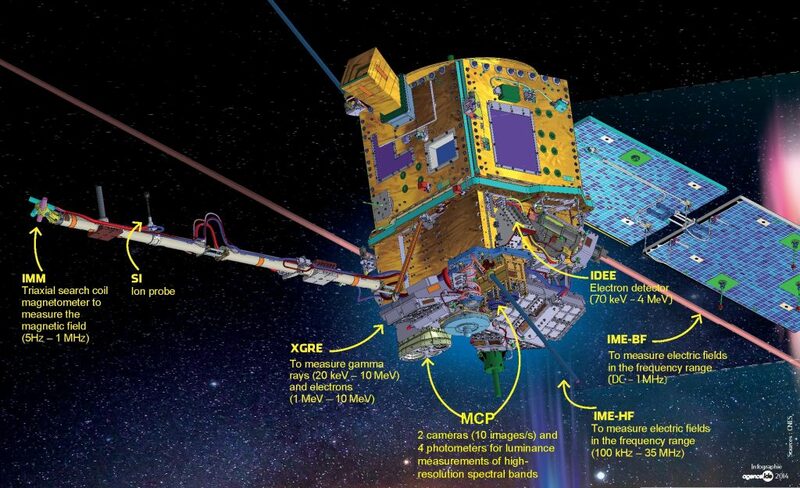 The satellite subsystems include a mass memory of 16 Gbits capacity, a high rate X band telemetry (16.8 Mbits/s) for the transmission of the scientific data. TARANIS will be a two-year mission with a four-year mission as an objective. It will fly in a quasi-polar sun-synchronous orbit with an inclination of 98° and an altitude close to 700 km. TARANIS is scheduled to be launched in 2020 from Kourou as a piggyback on a Vega rocket. Due to limitations in the power budget, in particular for the nighttime orbits, the scientific experiments will be switched off at high geographical latitudes (below −60° and above 60°) during the nominal operation modes. However, this will allow coverage for most regions where lightning activity is strong and therefore where the probability of observations of TLEs or/and TGFs is high. The TARANIS mission Centre will be operated by LPC2E. 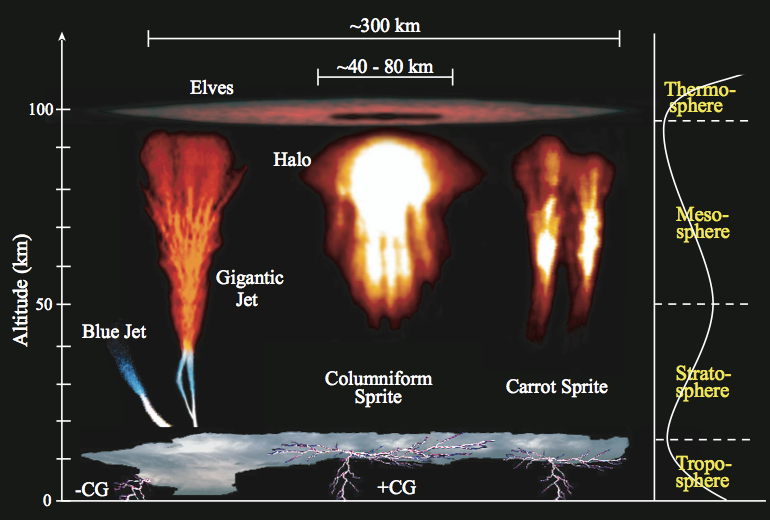 The observations of red sprites, blue jets, elves, sprite halos, gigantic jets, etc., named Transient Luminous Events (TLEs) and the observations of Terrestrial Gamma ray Flashes (TGFs) have pointed out the existence of impulsive transfers of energy between the Earth atmosphere and the space environment. Measurements performed by the ISUAL experiment onboard the FORMOSAT-2 satellite have shown that TLEs are fairly common in most regions of the globe. 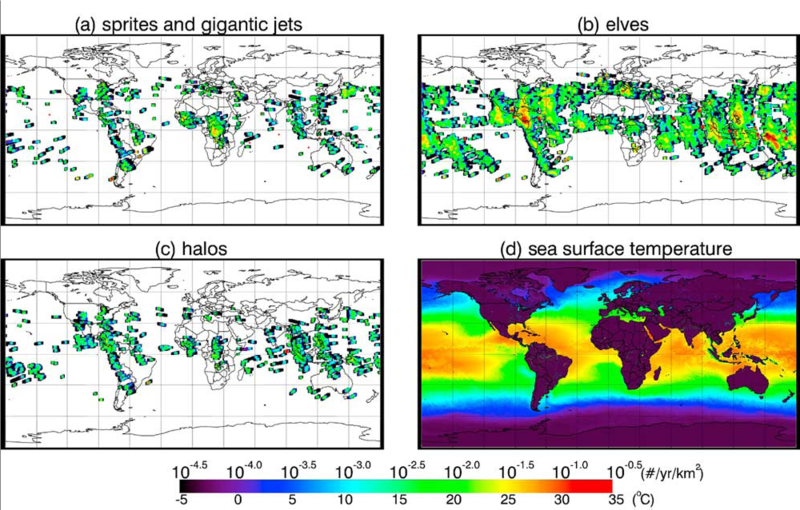 Global distribution of elves, sprites and halos from ISUAL observations (from Chen et al., 2008). RHESSI and FERMI observations show that TGFs involve very high energies, reaching 30 MeV. Processes that contribute to these phenomena and potential consequences on the Earth’s electrical and chemical environment are far from being fully understood. However, it is clear that the source of TGFs is itself a fundamentally new physical process that could have much broader implications and manifestations throughout the universe. Generated within the atmosphere, the TLEs and TGFs, as well as the physical mechanisms that produce them, may affect the chemical constitution and the dynamics of the atmosphere. TARANIS will complement ground-based, plane-based and balloon-based experiments: (i) by providing simultaneous observations at the nadir of lightning flashes, TLEs, and TGFs; (ii) by measuring the accelerated and precipitated electrons; (iii) by monitoring the electromagnetic environment. •Evaluate the potential effects of TLEs, TGFs, and bursts of precipitated and accelerated electrons (in particular lightning induced electron precipitation and terrestrial electron beams) on the Earth atmosphere or on the radiation belts. • MEXIC (Multi Experiment Interface Controller), electronics equipment to power and to manage the whole scientific payload. Scientific payload of TARANIS. Credit image CNES.